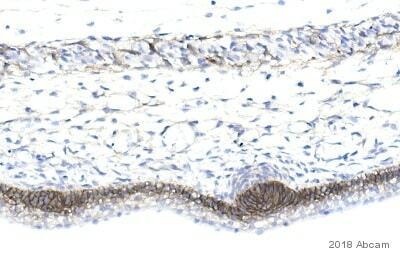 Rabbit monoclonal EGFR antibody [EP38Y]. Validated in WB, IP, IHC, Flow Cyt, ICC/IF and tested in Mouse, Rat, Human. Cited in 83 publication(s). Independently reviewed in 12 review(s). The immunogen for this product is a synthetic phospho-peptide corresponding to residues surrounding Tyr1068 of human EGFR. After screening, clone “EP38Y” was found to recognize total EGFR and is not specific to phosphorylated-Tyr1068 EGFR. This product yielded a strong signal in western blot using A431 (human squamous carcinoma) lysate which naturally overexpresses the EGFR protein. Western blot conditions may need to be optimised for cell lines and tissues that express lower levels of endogenous EGFR. The mouse and rat recommendation is based on the WB results. 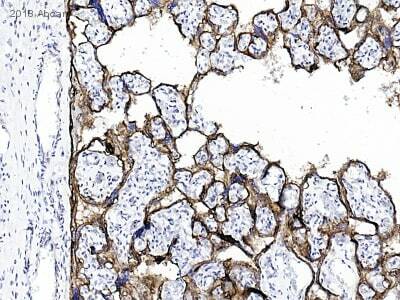 This antibody may not be suitable for IHC with mouse or rat samples. Synthetic peptide within Human EGFR. The exact sequence is proprietary. Synthetic phospho-peptide corresponding to residues surrounding Tyr1068 of mature human EGFR. ICC/IF: A431 cells. WB: HeLa, Caco-2 and A431 cell lysate; Rat liver and skin lysate; Mouse lung and skin lysate; Murine macrophage lysate. IP: HeLa whole cell lysate (ab150035). Flow Cyt: A431 cells. IHC-P: Human cervical carcinoma, endometrial carcinoma, glioma, tonsil and renal cell carcinoma tissue. IHC-P: Rat skin tissue. Our Abpromise guarantee covers the use of ab52894 in the following tested applications. WB 1/1000 - 1/10000. Detects a band of approximately 175 kDa (predicted molecular weight: 134 kDa).Can be blocked with EGFR peptide (ab204282). For unpurified use at 1/100. Receptor tyrosine kinase binding ligands of the EGF family and activating several signaling cascades to convert extracellular cues into appropriate cellular responses. Known ligands include EGF, TGFA/TGF-alpha, amphiregulin, epigen/EPGN, BTC/betacellulin, epiregulin/EREG and HBEGF/heparin-binding EGF. Ligand binding triggers receptor homo- and/or heterodimerization and autophosphorylation on key cytoplasmic residues. The phosphorylated receptor recruits adapter proteins like GRB2 which in turn activates complex downstream signaling cascades. Activates at least 4 major downstream signaling cascades including the RAS-RAF-MEK-ERK, PI3 kinase-AKT, PLCgamma-PKC and STATs modules. May also activate the NF-kappa-B signaling cascade. Also directly phosphorylates other proteins like RGS16, activating its GTPase activity and probably coupling the EGF receptor signaling to the G protein-coupled receptor signaling. Also phosphorylates MUC1 and increases its interaction with SRC and CTNNB1/beta-catenin. Isoform 2 may act as an antagonist of EGF action. Phosphorylation at Ser-695 is partial and occurs only if Thr-693 is phosphorylated. Phosphorylation at Thr-678 and Thr-693 by PRKD1 inhibits EGF-induced MAPK8/JNK1 activation. Dephosphorylation by PTPRJ prevents endocytosis and stabilizes the receptor at the plasma membrane. Autophosphorylation at Tyr-1197 is stimulated by methylation at Arg-1199 and enhances interaction with PTPN6. Autophosphorylation at Tyr-1092 and/or Tyr-1110 recruits STAT3. Dephosphorylated by PTPN1 and PTPN2. Monoubiquitinated and polyubiquitinated upon EGF stimulation; which does not affect tyrosine kinase activity or signaling capacity but may play a role in lysosomal targeting. Polyubiquitin linkage is mainly through 'Lys-63', but linkage through 'Lys-48', 'Lys-11' and 'Lys-29' also occurs. Deubiquitination by OTUD7B prevents degradation. Ubiquitinated by RNF115 and RNF126. Methylated. Methylation at Arg-1199 by PRMT5 stimulates phosphorylation at Tyr-1197. Secreted and Cell membrane. Endoplasmic reticulum membrane. Golgi apparatus membrane. Nucleus membrane. Endosome. Endosome membrane. Nucleus. In response to EGF, translocated from the cell membrane to the nucleus via Golgi and ER. Endocytosed upon activation by ligand. Colocalized with GPER1 in the nucleus of estrogen agonist-induced cancer-associated fibroblasts (CAF). This blot was produced using a 4-12% Bis-tris gel under the MOPS buffer system. The gel was run at 200V for 50 mins before being transferred onto a Nitrocellulose membrane at 30V for 70 mins. The membrane was then blocked for an hour before being incubated with unpurified ab52894 overnight at 4°C in the presence of loading control ab18058 (Mouse monoclonal [SPM227] to Vinculin diluted 1:10000). Antibody binding was detected using IR-labeled goat anti-Rabbit Ab at a 1:10,000 dilution for one hour at room temperature before imaging. This product yielded a strong signal in western blot using A431 (human squamous carcinoma) lysate which naturally overexpresses the EGFR protein. Western blot conditions may need to be optimised for cell lines and tissues that express lower levels of endogenous EGFR. 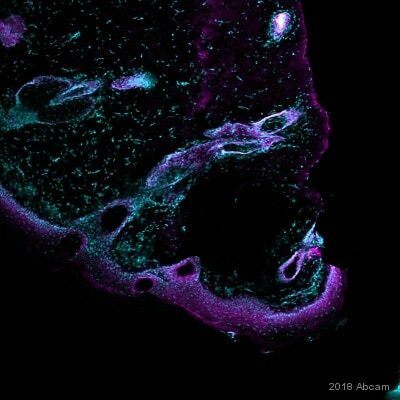 Paraformadehyde-fixed, 0.05% Triton-X permeabilized mouse adult oral epithelia (frozen sections) tissue labeling EGFR (red) using ab52894 at 1/1000 dilution in immunohistochemical analysis. A blocking step was performed using 5% Gel Block (5% normal donkey serum, 3% BSA, 8% gelatin and 0.1% Triton X-100 in 1X PBS) at 20°C. Primary antibody was incubated for 24 hours at 4°C. Secondary antibody was polyclonal Donkey anti-rabbit Rhodamine Red-X antibody at 1/500 dilution. Tissues were micro-dissected into ice-cold 1x PBS and fixed for 30 minutes at room temperature (RT) in 4% paraformaldehyde. After washing with PBS 3 times for 10 minutes at RT, samples were equilibrated overnight at 4°C in 15% sucrose solution and then mounted in Tissue-Tek optimal cutting temperature (OCT) compound (Electron Microscopy Services). 12 μm sagittal and coronal sections were cut on a Leica CM1950 cryostat onto Fisher SuperFrost Plus slides and stored at -80°C. Samples were dried at 37°C for 30 minutes before a 1 hour incubation with gelatin block (5% normal donkey serum, 3% BSA, 8% gelatin, and 0.1 Triton X-100 in 1X PBS). Slides were incubated with primary antibodies (Rt-Ki67 and Rb-EGFR) diluted in gelatin block overnight at 4°C and washed 3 times for 5 minutes in 1X PBS at RT. Secondary antibodies (Donkey anti-rat Alexa Fluor®488 and Donkey anti-rabbit Rhodamine Red-X) were also diluted in gelatin block and added to the slide for 2 hours at RT. DAPI (1/2000) was added to the slide for 5 minutes at RT. Samples were mounted in 100 μl ProLong Gold and covered by glass coverslips. Immunohistochemistry (Formalin/PFA-fixed paraffin-embedded sections) analysis of human cervical carcinoma tissue sections labeling EGFR with purified ab52894 at 1:100 dilution (0.95 μg/ml). Heat mediated antigen retrieval was performed using EDTA buffer, pH 9.0. Tissue was counterstained with hematoxylin. ab97051 Goat Anti-Rabbit IgG H&L (HRP) secondary antibody was used at 1:500 dilution. PBS instead of the primary antibody was used as the negative control. Immunocytochemistry/ Immunofluorescence analysis of A431 (Human epidermoid carcinoma epithelial cell) cells labeling EGFR with purified ab52894 at 1:250 dilution (0.4 μg/ml). Cells were fixed in 4% paraformaldehyde and permeabilized with 0.1% Triton X-100. Cells were counterstained with ab195889 Anti-alpha Tubulin antibody [DM1A] - Microtubule Marker (Alexa Fluor® 594) 1:200 (2.5 μg/ml). ab150077 Goat anti rabbit IgG(Alexa Fluor® 488) was used as the secondary antibody at 1:1000 dilution. DAPI nuclear counterstain. Flow Cytometry analysis of A431 (Human epidermoid carcinoma epithelial cell) cells labeling EGFR with purified ab52894. Cells were fixed with 4% paraformaldehyde (10 mins) and permeabilized with 90% methanol for 30 mins. Then incubated in 1x PBS / 10% normal goat serum to block non-specific protein-protein interactions followed by ab52894 at 1/20 dilution (red) for 30 mins. A Goat anti rabbit IgG (Alexa Fluor® 488) secondary antibody was used at 1:2000 dilution. Isotype control - Rabbit monoclonal IgG (Black). 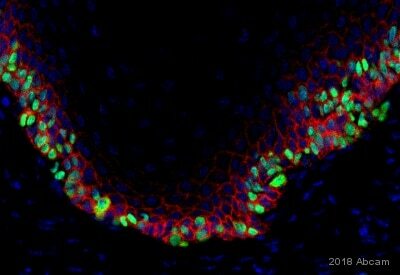 Unlabeled control - Cell without incubation with primary antibody and secondary antibody (Blue). Immunohistochemical anlaysis of rat skin tissue (frozen sections) labeling EGFR using ab52894 at 1/500 dilution. Tissue was fixed using acetone. Primary antibody was incubated for 16 hours at 8°C using antibody diluent ab64211. Secondary antibody was a Goat anti-Rabbit IgG H&L (Alexa Fluor®488)(ab150077). ab52894 (purified) at 1:20 dilution (0.5 µg) immunoprecipitating EGFR in HeLa (Human cervix adenocarcinoma epithelial cell) whole cell lysate. For western blotting, VeriBlot for IP Detection Reagent (HRP) (ab131366) was used for detection at 1:1000 dilution. Observed band size: 175 kDa why is the actual band size different from the predicted? Unpurified ab52894 showing positive staining in endometrial carcinoma tissue. Unpurified ab52894 stained A431 (Human epidermoid carcinoma cell line) cells. The cells were fixed in 100% methanol for 5 mins at -20°C and then incubated in 1% BSA / 10% normal goat serum / 0.3M glycine in 0.1% PBS-Tween for 1 hour at room temperature to permeabilize the cells and block non-specific protein-protein interactions. 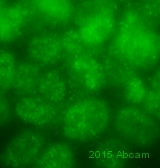 The cells were then incubated with the antibody (ab52894 at 1 in 500) overnight at +4°C. The secondary antibody (pseudo-colored green) was Goat Anti-Rabbit IgG H&L (Alexa Fluor® 488) preadsorbed (ab150081) used at a 1/1000 dilution for 1 hour at room temperature. Alexa Fluor® 594 WGA was used to label plasma membranes (pseudo-colored red) at a 1/200 dilution for 1 hour at room temperature. DAPI was used to stain the cell nuclei (pseudo-colored blue) at a concentration of 1.43 µM for 1 hour at room temperature. Overlay histogram showing A431 (Human epidermoid carcinoma cell line) cells stained with unpurified ab52894 (red line). The cells were fixed with 80% methanol (5 mins) and then permeabilized with 0.1% PBS-Tween for 20 mins. The cells were then incubated in 1x PBS / 10% normal goat serum / 0.3M glycine to block non-specific protein-protein interactions followed by the antibody (ab52894, 1/100 dilution) for 30 mins at 22°C. The secondary antibody used was a goat anti-rabbit DyLight® 488 (IgG H+L) (ab96899) at 1/500 dilution for 30 mins at 22°C. Isotype control antibody (black line) was rabbit IgG (monoclonal) (1 μg/1x106 cells) used under the same conditions. Unlabeled sample (blue line) was also used as a control. Acquisition of >5,000 events were collected using a 20mW Argon ion laser (488nm) and 525/30 bandpass filter. 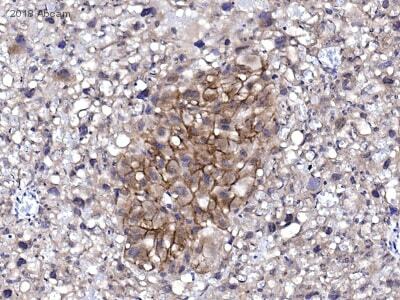 Unpurified ab52894 showing positive staining in glioma tissue. 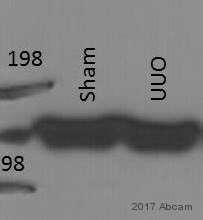 Western blot - Anti-EGFR antibody [EP38Y] (ab52894)Image is courtesy of an anonymous AbReview. Blocking was with 5% BSA incubated for 1 hour at 25°C. Observed band size: 165 kDa why is the actual band size different from the predicted? Gel running conditions: 4-15%, reduced and denatured. Incubation (with primary antibody): 16 hours, 4 Celsius. Unpurified ab52894 showing positive staining in normal tonsil squamous cell tissue. Unpurified ab52894 showing positive staining in renal cell carcinoma tissue. Unpurified ab52894 showing positive staining in cervical carcinoma tissue. Publishing research using ab52894? Please let us know so that we can cite the reference in this datasheet.